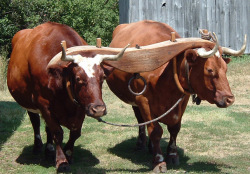 O~ A yoke is a heavy wooden harness used on oxen so that they can pull equipment; so that they can work. We may be carrying the heavy burden of sin, regret, failure, etc. Jesus wants us to drop that load and take a break with Him. When it’s time to return to the work of living, He offers His yoke. He is offering to share the burdens of life with us as we work together with Him. A.~My burdens are VERY heavy this week. My inclination is to hide, sleep, and ignore the stressful situations I am facing. When I bring my broken heart to Him, He does give me peace. I have felt His calming in my heart and mind this week as I am facing daunting changes in my life. By bringing everything I’m worried about and wresting with openly to Him, I am taking off that heavy yoke. I have true faith that everything will work out and He will be glorified. When I share His yoke, I am tethered to Him. He can gently guide me as I walk in step with Him. We are doing life as a team and the work is much easier. P~ Father, thank you for accepting my burdens and teaching me how to lay them at your feet. My heart is broken and I am feeling out of sorts, but I hear Your soothing voice in my ear reminding me it’s going to be alright. Thank you for calming your child. I trust you as we walk together into the next chapter. I trust in Your plan and vision and cannot wait to see how You redeem me yet again. I love you so much. Posted on February 11, 2019, in Uncategorized and tagged Bible, Bible Study, daily devotions, discover one thing, discoveronething, discoveronething.com, exodus, Genesis, God, Gospel of Luke, Jesus, Luke, Luke 10:42, Matthew, new years resolution, SOAP, SOAP note. Bookmark the permalink. 1 Comment. Praying for you this morning, my dear friend. You are so loved by so many. Print out this journal and keep it with you, (or take a picture of the ox and make it your screen saver to remind you during the rough moments that God is with you.